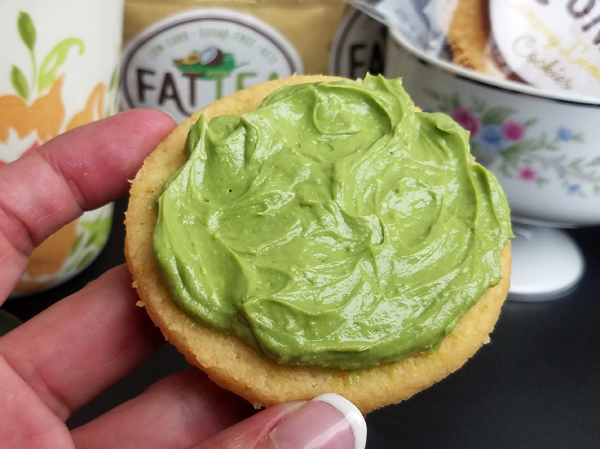 So when FatSnax came out with lemon cookies and “Fat Tea” (a new keto matcha with MCT) I didn’t think I’d be the best fit to review it or offer any feedback. 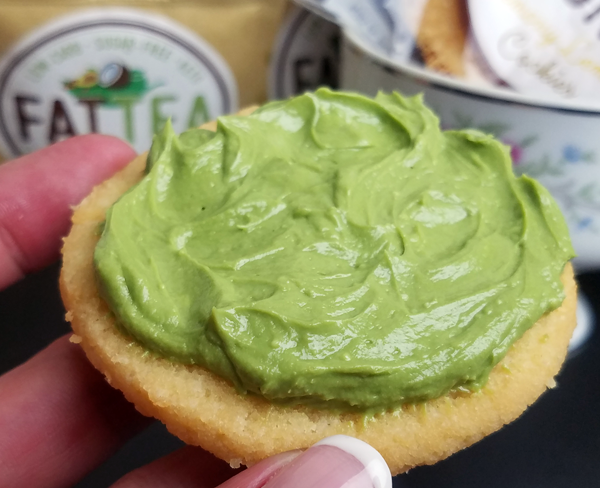 If you have keto products you think you don’t like, or you’re ignoring in your low carb pantry, you’ll love these FUN creative ideas to totally turn things around! My housekeeper agreed lol, I had to send some home with her! 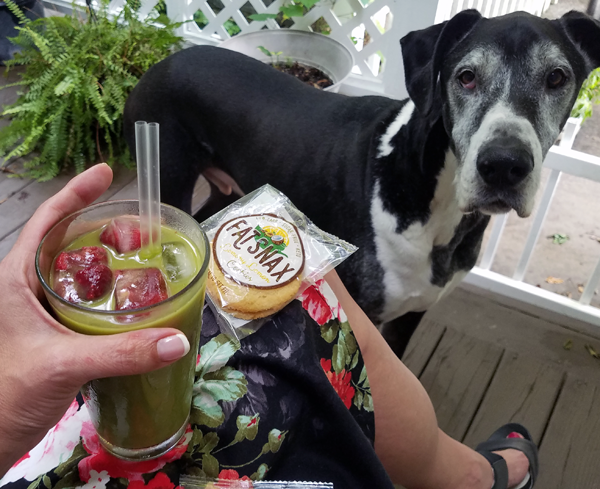 And last night on a hot late summer evening on my back deck… iced Matcha Tea with raspberries. Something I never EVER thought I would drink, or even like. 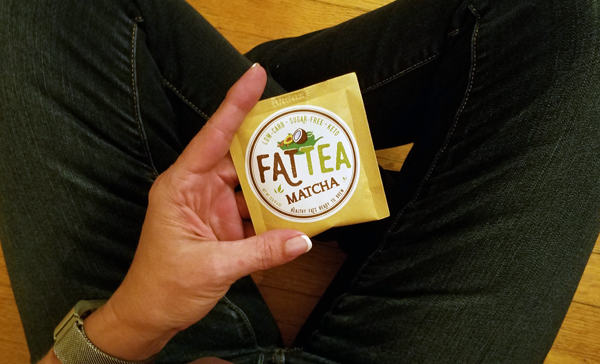 When FatSnax first came out with their “Fat Tea” Matcha Tea packets they sent me some to review. I loved the concept, but to be honest – I had no idea what to do with it. 😛 Like I said, drinking something green (or even the word “matcha”) didn’t appeal to me at all. 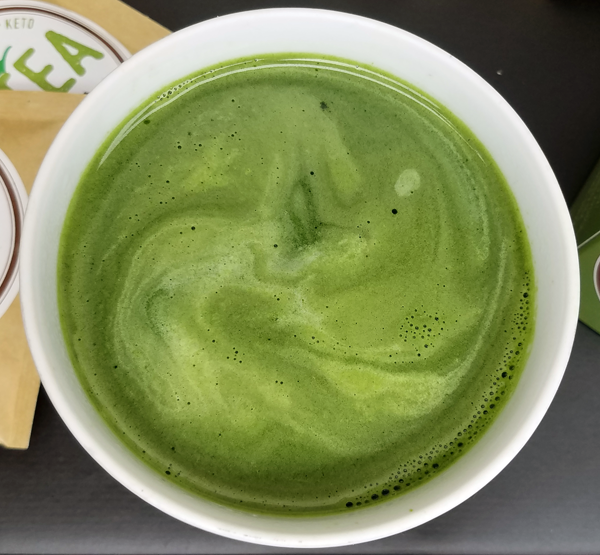 I’ve even heard other people say they don’t really like matcha tea, but drink it anyway – because it’s healthy. And when I told them MY fun new ways of enjoying it, they got *excited* about it again! And I don’t even like lemon flavor usually! They’re super excited about these two new products, and while I wasn’t at first that totally changed when I took the time to actually try them – in totally DIFFERENT ways. So when they offered to send me more to play around with at home, and offered to sponsor a post here for me to share my opinion & creative ideas with you, I said YES! I know we all have different taste preferences, and tons of people have told me they LOVE lemon flavor and miss fruity flavors on a keto diet. 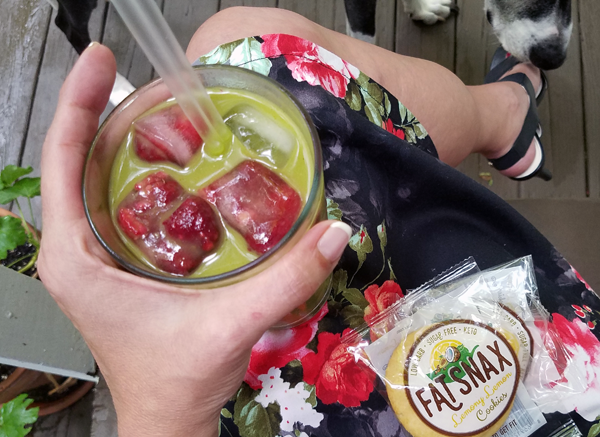 I’m not a “fruity flavor” person myself, but I have to admit… the cookies and tea are SO light & refreshing on a hot summer day! 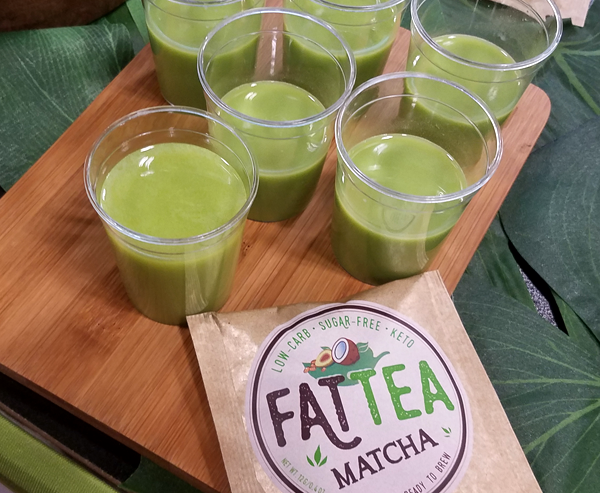 Let’s start with their Fat Tea though, because a Keto Matcha is a really cool concept – and FatSnax really took that concept to the next level with this product. You can view all their products at FatSax.com and you’ll get 5% off when you join their email list. Just reading the box, this appealed to me for all the right reasons. It’s only 1 net carb per packet, with 7 full grams of MCT. 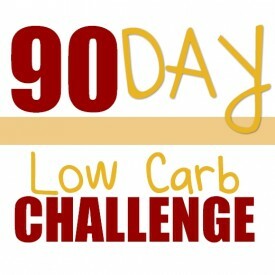 You may remember that’s one of the ways to improve your ketone levels, which is something I’m working on at the moment. Do You Like Matcha Tea? Like I said, I had never tried it before. I expected it to taste like it looked: thick and gross. I was actually surprised that it has a very light and refreshing flavor. It’s the same if you want it cold – you can add it to a shaker bottle with water or coconut milk, or you can just stir it into a glass of water and then add ice. It doesn’t require brewing like I assumed, which makes it super easy to enjoy. Of course, being a coffee drinker it’s hard to sway me to a totally new hot drink. And like I said, it was the ICED matcha tea that really got me hooked, so that’s how I decided to enjoy it last night. 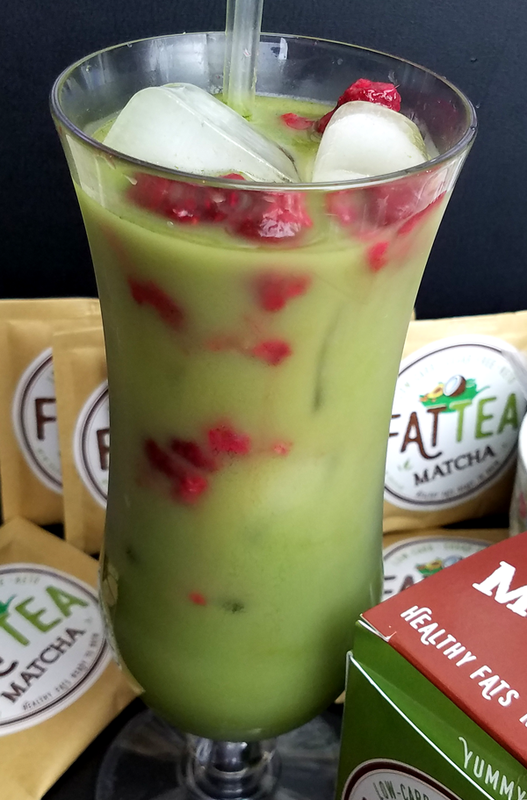 And I got creative and added raspberries to my Iced Matcha Fat Tea, which made it prettier (lol) and added a nice fruity bump to the light refreshing flavor. It’s light and refreshing, already slightly sweetened, and WAY better than “iced tea” which has always had a bitter taste to it to me. 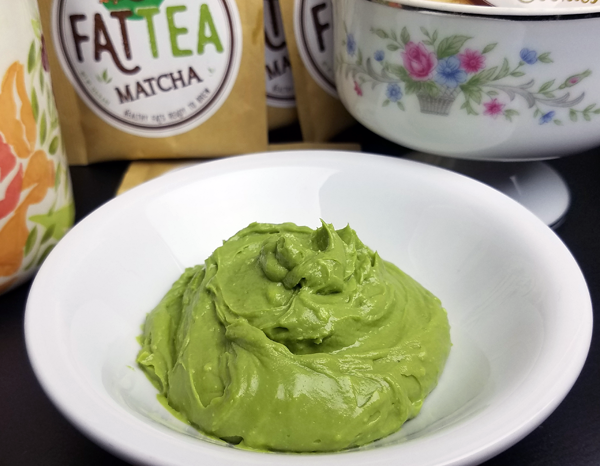 The FatSnax keto friendly matcha tea is good hot. I love the flavor, and add a little heavy cream & vanilla and it’s pretty heavenly to be honest. But drinking it iced with raspberries is what really tickled my tastebuds! 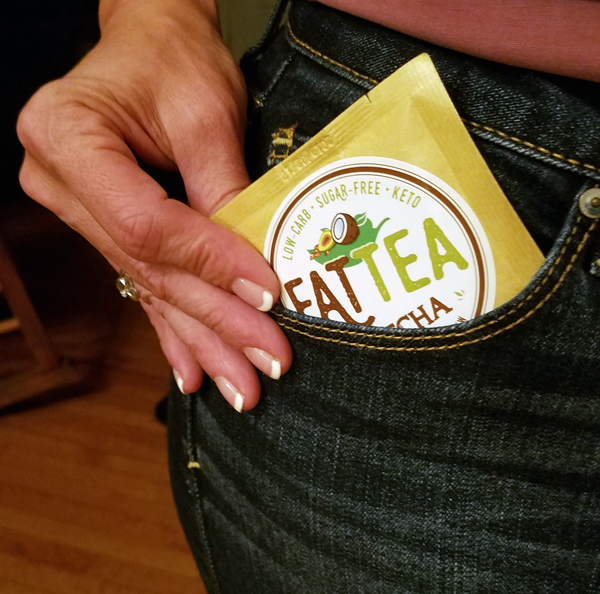 You simply mix one packet of the FatSnax Fat Tea with 4 tablespoons (or 2 ounces) of cream cheese. 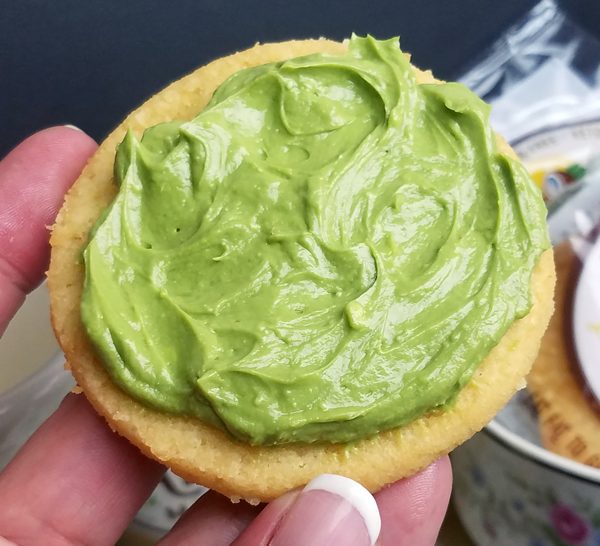 I used Philadelphia 5 Simple Ingredients brand cream cheese, which is only half carb per ounce – making this “frosting” VERY low carb, and full of healthy fats. 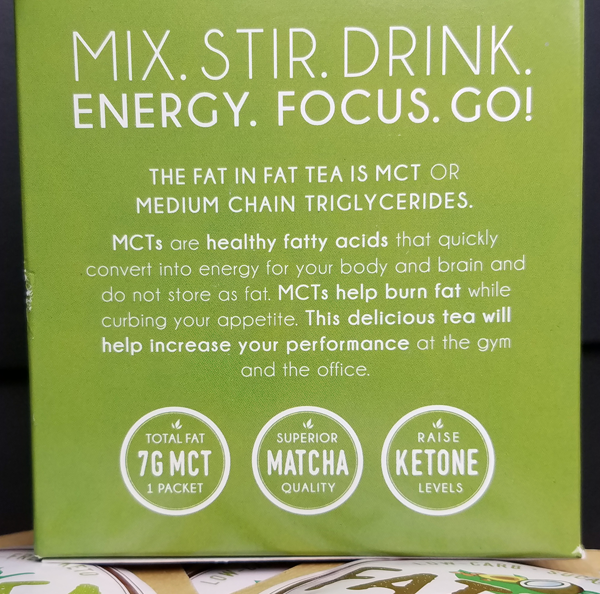 Including that all-important MCT for increasing your ketone levels! 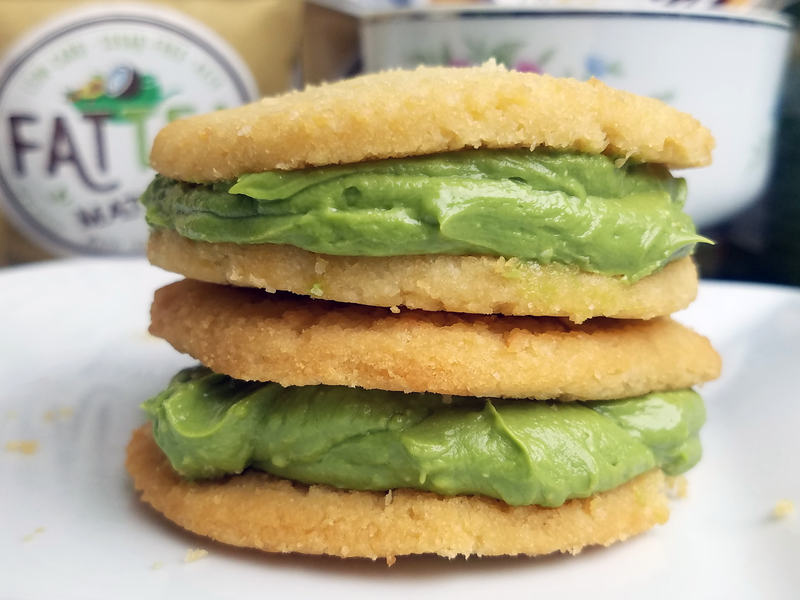 Since I was going to put them on tart Lemony Lemon FatSnax Cookies, and the Fat Tea itself is not super sweet (just right! ), I decided to add just HALF a TBSP (only a dab!) of sugar free vanilla syrup. 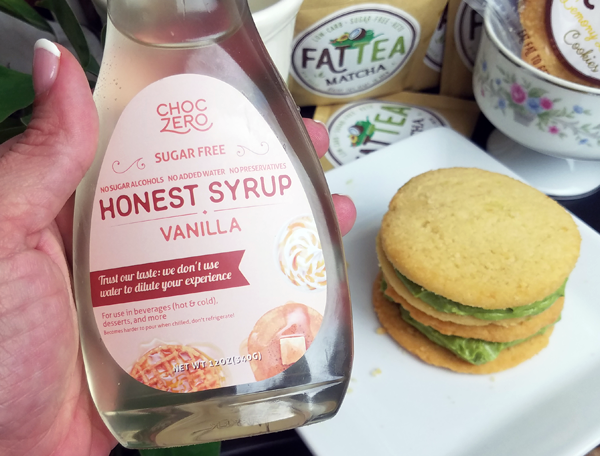 I used ChocZero Vanilla Syrup, but you could just add a little vanilla extract or any sugar free vanilla – if you want to sweeten it to taste. And the entire bowl of icing was only 2 net carbs – which was enough to ice four cookies, easily. Very liberally actually! 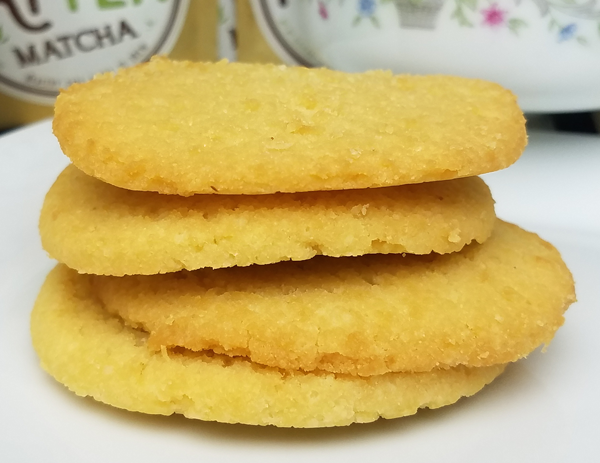 The brand new Lemony Lemon FatSnax Cookies have this amazing aroma the minute you open the package, and then a super light texture with the perfect lemon flavor. They’re very soft, almost like a super moist shortbread. They don’t crumble all over or fall apart on you at all, and they’re not overly sweet – yet they’re packed with flavor. I think “shortbread” is the closest description I can get to both the texture and flavor. They aren’t overly sweet and they don’t have that bad aftertaste or weird tingling effect in your mouth like some other keto sweets. It’s a very light snack full of healthy fats and GREAT flavor. 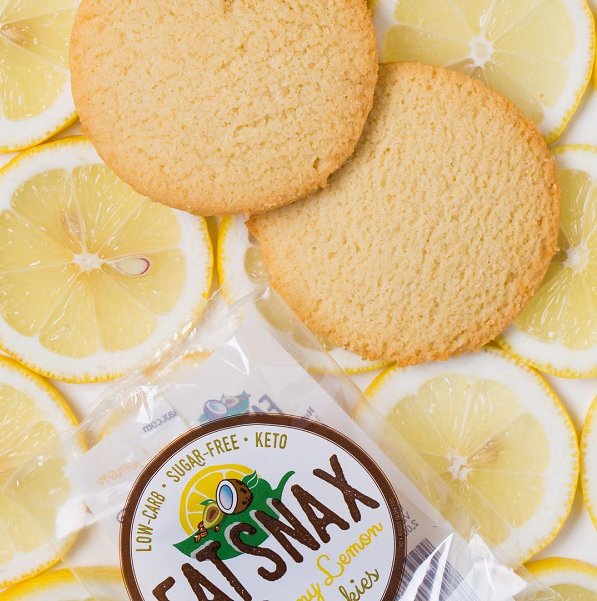 The new Lemony Lemon FatSnax Cookies are only 1 net carb each. 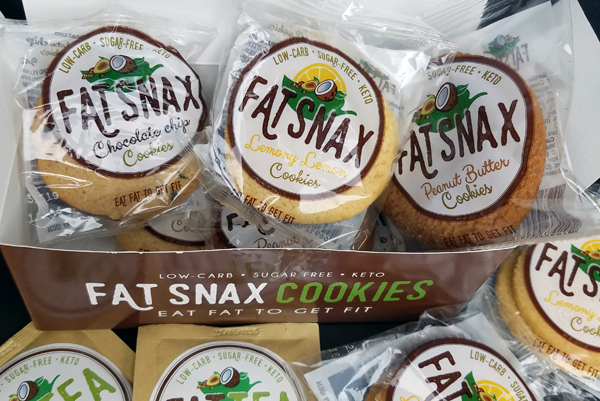 They also offer a Variety Pack with all three flavors of their FatSnax Cookies: chocolate chip, lemony lemon and peanut butter. I remember not really caring for the chocolate chip & peanut butter FatSnax cookies before. It wasn’t that I didn’t like them, I just didn’t LOVE them. They were good, but not something I just HAD to have. Anyway, I was trying the chocolate chip & peanut butter cookies again recently and had to ask them if they changed the recipe?? Their answer: Nope, it’s the same! I asked because all of a sudden they taste GREAT to me now. Color me impressed. I thought for sure they changed the recipe! 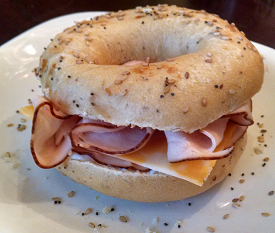 I love the quality of ingredients they use, I love the super soft light texture and perfectly sweetened flavor. And I especially love that they don’t have an icky aftertaste or weird tingling effect in your mouth. These are GREAT. 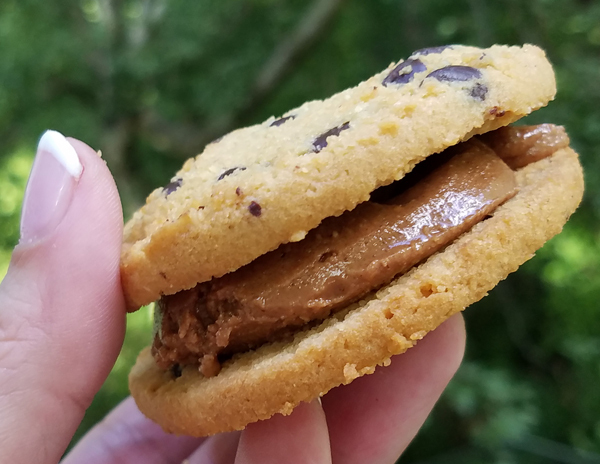 I can make a peanut butter & almond butter “cookie sandwich” and easily call it breakfast with my coffee, or have it as an afternoon snack, and still feel like I’m eating healthy – and high quality foods. 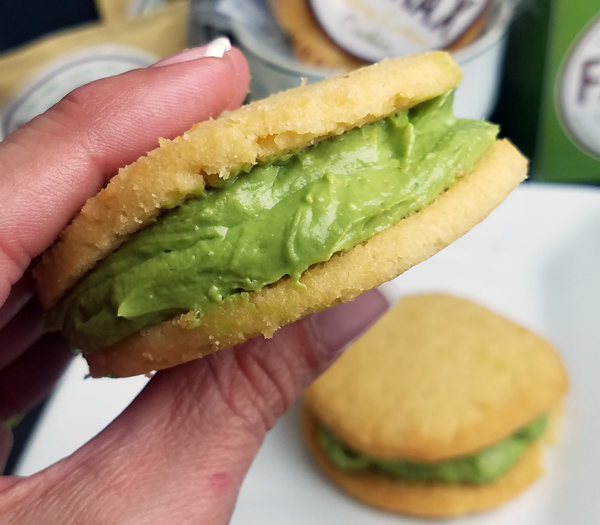 This though, the Matcha Frosting idea… Brilliant! Which only took a few quick seconds, btw. That makes it super convenient to fuel my hikes by adding it to my bottled water or shaker bottle, pulling it out in a restaurant to add to my ice water, making a quick hot tea in a hotel room – you name it. And you know how I always swipe the cream cheese off the condiment section of a hotel breakfast bar? 🙂 Now I can easily whip up something delicious to dip my berries & pecans in while traveling! 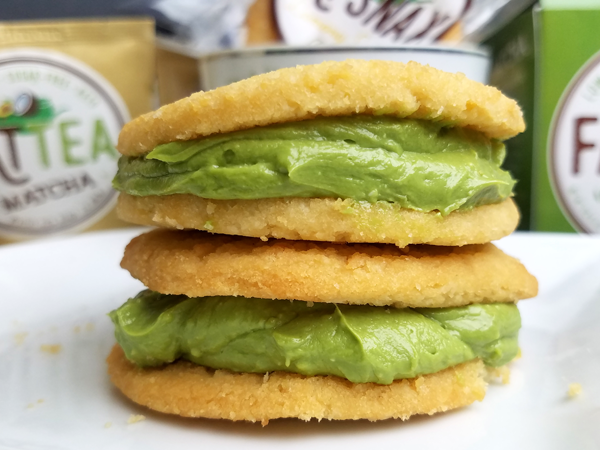 Have you tried FatSnax Cookies or Fat Tea yet? 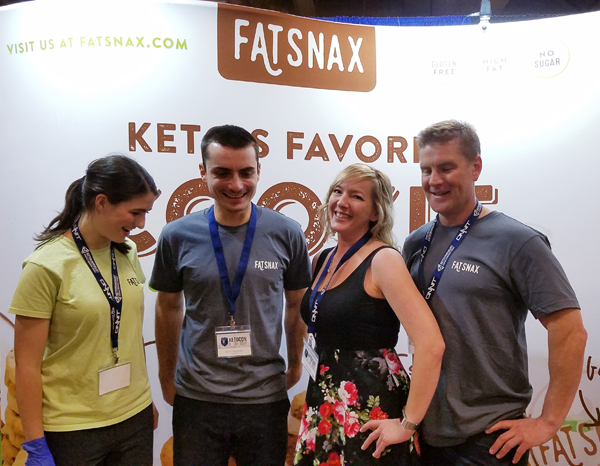 If you’ve tried any of the FatSnax products I would love to hear your thoughts, which flavors you liked best, and HOW you like to enjoy them! I got to meet them in June at KetoCon (a Keto Conference). Here’s a photo of us goofing off together at their booth – which was a VERY popular spot thanks to those Lemony Lemon Keto Cookie samples! For now, I’m really enjoying the Fat Tea over ice in the late afternoon as a quick pick-me-up. Plus a good dose of MCT without the icky oily mess or feel! I was totally wrong about not liking Matcha Tea. Or maybe it’s a good thing I tried this Fat Tea version first – because it’s VERY good. Anyway, if you don’t like matcha tea (or haven’t tried it because you *think* you won’t) – I highly recommend you try it ICED. And definitely make frosting out of it too. You’ll be SOLD. 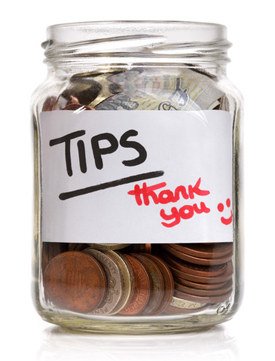 Wow, great ideas for getting in your MCT oil benefits in a tasty treat. Thanks for putting in the effort to come up with these great ideas. I know right, Cynthia! 🙂 I love the idea of being able to add it to my water bottle on a hike for an energy boost – or to whip up a frosting to dip berries & pecans in, or to spread on low carb cookies (even my own homemade cookies!). Now the chocolate chip with almond butter——oh yeah. Good stuff. LOL I don’t even LIKE lemon flavor *anything* usually, but these are SO good. The matcha is new to me too, and I didn’t even think I could drink something green (haha) but it’s super light and refreshing. Way better than regular tea! I’m like you – usually peanut butter/chocolate/etc. But to be honest, that gets boring after awhile. This was a fun, refreshing flavor-blast switch up that was delicious! I’m so glad I finally tried both, and even more so: together! I doubt I ever would have tried it (either of them) if they hadn’t had samples out at the event. It has me encouraged to try even more stuff, because my taste buds have obviously changed a lot since going keto. I have become a fan of the Fat Snax cookies. The lemon is my absolute favorite. Chocolate chip is my next, but only okay. The peanut butter is my least favorite. I have to choke those down. 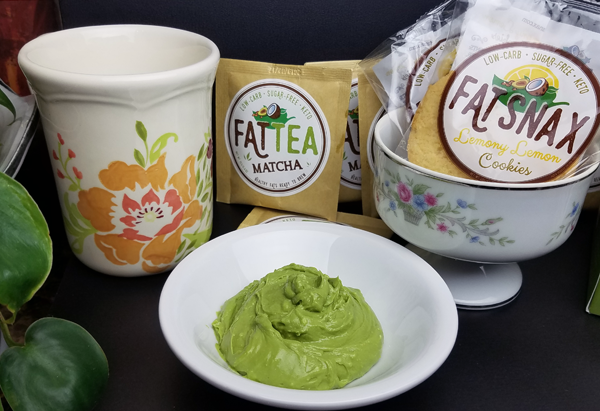 I love matcha tea but have not tried Fat Snax’s, but I will. Thanks for the raspberry idea. The lemon is SO good! 🙂 I think the peanut butter and chocolate chip FatSnax cookies are more like shortbread, and I love those with my morning coffee, or as a quick snack with a handful of pecans in the afternoon. But the lemon is a delicious treat! I do like their matcha, especially that they’re single serve packets. That’s super convenient. And I definitely love it iced, or in my water bottle while I’m hiking. 😉 Enjoy! !